WHAT’S NOT GREEN ABOUT “REGULAR” SHAMPOO FOR DOGS? ​When it comes to dog shampoo, there are plenty of inexpensive, natural, and gentle ways to make sure your pup is clean and healthy. 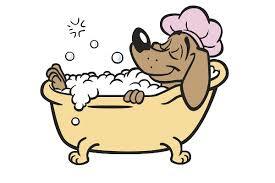 All dogs need the occasional bath, even dogs that don't shed. When you’re talking about washing the yuck off your dog, there are plenty of inexpensive, natural, and gentle ways to wash a dog. Homemade dog shampoo might be the answer you need. Some of the ingredients in commercial dog shampoos may sound nice to us, but they can cause itching, flakiness, and general discomfort when applied to a dog’s very sensitive skin. Some ingredients don’t sound particularly nice in the first place! Polyethylene Glycol (PEG), for example, is a common cosmetic base, and may be found in some dog shampoos. It is a petroleum product that can sap the natural moisture from skin. Sodium Lauryl Sulfate (SLS) and Sodium Laureth Sulfate (SLES), which are detergents commonly found in dog shampoos, have been linked to eye damage, diarrhea, and severe skin irritation. Many human-grade cosmetics are phasing out certain chemicals that might still be found in dog shampoos. These chemicals may include phthalates, which control viscosity (goopiness versus runniness), or paraben, a preservative added to extend shelf life. While many of us aren’t too concerned about the rare application of these small dose chemicals during doggy bath time, we should be concerned about washing these chemicals down the drain. Skin pH is a tricky thing. Certain dogs are naturally more acidic than others, and we’re not talking about personalities. When combining these common ingredients to make dog shampoo, be sure you’re balancing alkaline substances (like baking soda) with acidic substances (like vinegar) in a neutral base (like water) to keep your shampoos pH balanced for your dog’s skin. Too alkaline should not be a problem, but too acidic will irritate, and can even harm, your dog’s skin. Shake well upon mixing, and again before every use. Shred 3-4 tablespoons of solid, unscented castile soap with a cheese grater. Or use 2-3 tablespoons of liquid unscented castile soap. Add 4 cups of hot water. Mix with a spoon or whisk until the soap solids are dissolved. Add 1 cup of white or apple cider vinegar. Pour ingredients into a bottle for storage. Shake well before each use. You won’t need much of this soap. It lathers well. Most castile soaps will have a pH of around 8. Mix 2 teaspoons of fresh rosemary into 4 cups of water, and bring the water to a boil. As soon as it boils, remove it from the heat, and allow it to sit for ten minutes. Strain the rosemary out, and allow the rosemary water to cool until it’s about body temperature. After a bath, pour the infusion over your dog’s coat for extra softness and shine. Sprinkle half a cup of dry baking soda all over your dog. Avoid the face entirely - we don’t want them breathing in the baking soda, or getting it in their eyes. Rub the baking soda in, then give your dog a good brushing. Odors will be reduced or eliminated, and the baking soda should not irritate anyone’s skin. Wet your dog, then shut the water off. Lather them up, and be sure to scrub all over, even between the toes. Avoid eyes, ears, nose, and mouth. The face can be cleaned with a damp wash cloth separately. When it’s time, turn the water back on for a good rinse. If you give a good first wet-down before shampooing, even the muddiest dog will be already partially clean. Most dogs will be clean enough after one thorough lathering and a final rinse. Washing only once saves both water and shampoo, and reduces the chance of drying out your dog’s skin. Save the hair dryer for yourself, not your dog. Using a for-humans hair dryer on your dog can dry out your dog’s skin, and it wastes energy! Unless you use a groomer that adheres to green practices, chances are your groomer will use more energy, waste more water, and use more toxic cleansers than you might use at home.